Inspired by classic woven blankets, the Hygge Holiday Throw turns any chair or couch into an inviting spot to curl up. 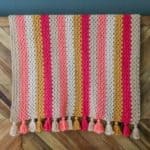 Despite being full texture, this beginner crochet blanket pattern uses very simple crochet stitches (and there’s a video tutorial!) Get the free pattern below or purchase the ad-free, printable PDF for $2.75 here. 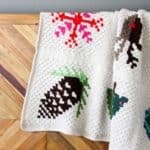 This free beginner crochet blanket pattern and video is a collaboration with my friends at Lion Brand Yarn. This post contains affiliate links. It’s starting to cool off here in Colorado, which is getting me in the mood for all things hygge. If you’re not familiar with the word “hygge,” it’s a Danish and Norwegian word–that’s very trendy at the moment!–for describing all things cozy that foster a feeling of comfort and togetherness. Um, sign me up for all the hygge you got. 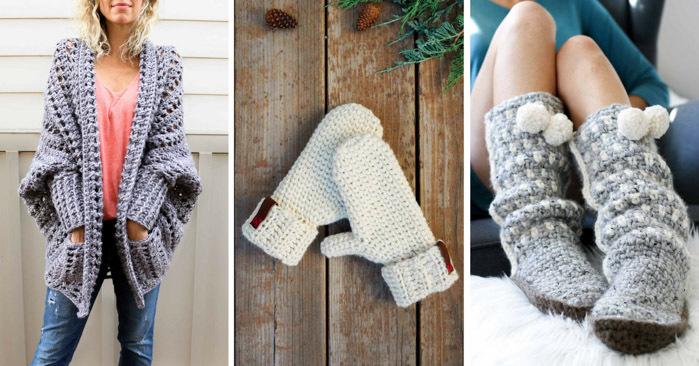 I’m guessing as a crochet-lover, you may have a pretty strong sense of hygge in your life already. I mean, most of what we make with yarn is in the pursuit of comfort and coziness, isn’t it? 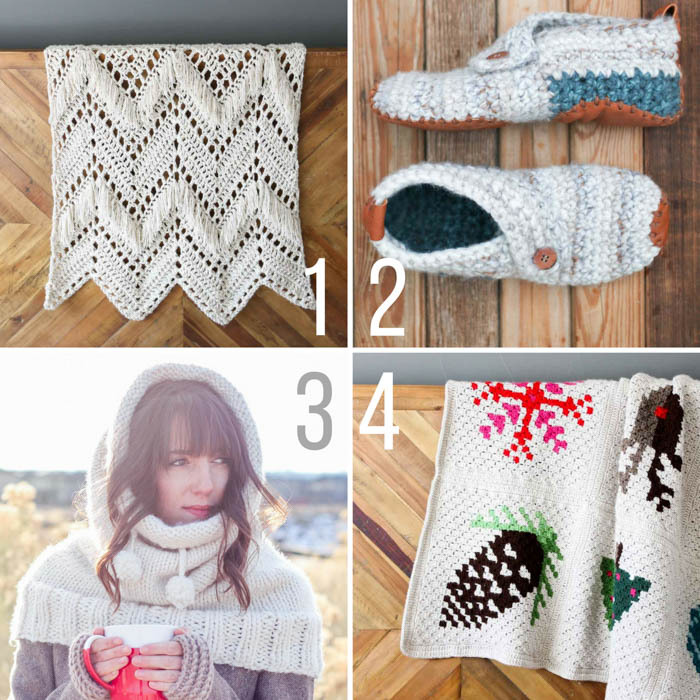 Below are a few other Make & Do Crew free crochet patterns that I think could add a good dose of hygge to your life. 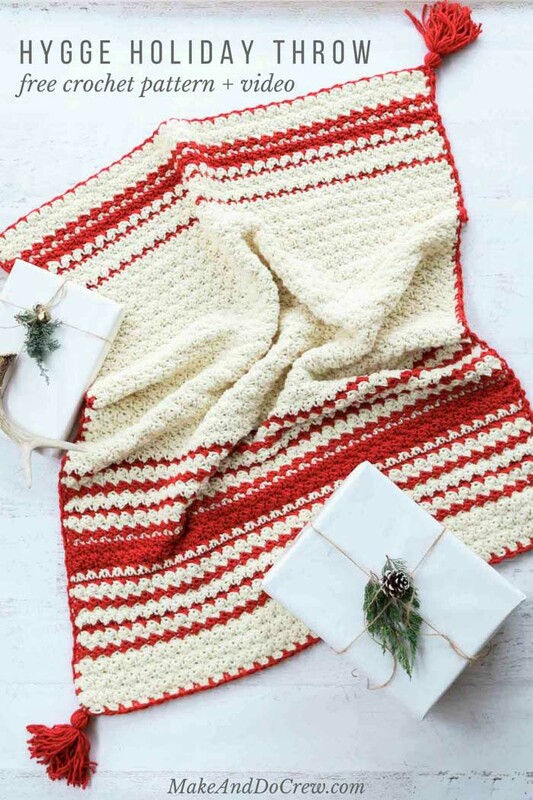 When I set out to design this beginner crochet blanket pattern, I had in mind that I wanted to create something that felt holiday-ish, but not as on-the-nose as my corner-to-corner Christmas afghan. Lion’s Pride Woolspun proved to be the perfect yarn for the job once again. (You can see it in action in my free Cocoon Cardigan pattern as well.) 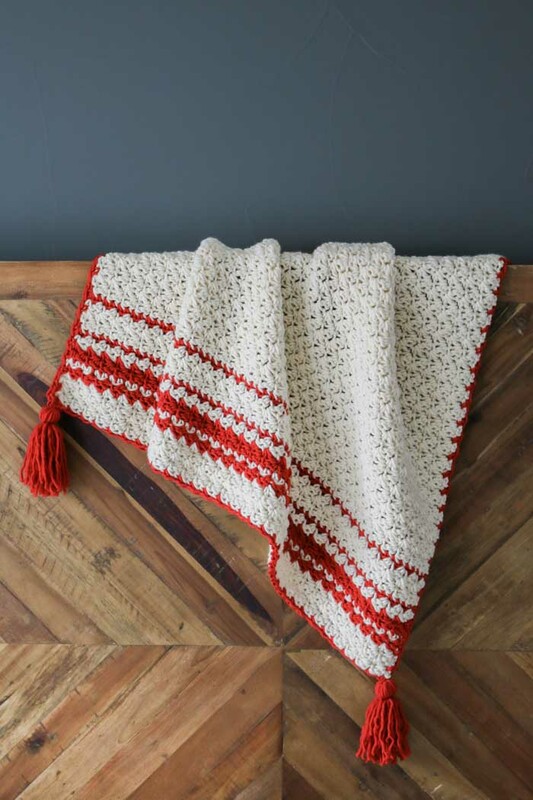 The reason I love Woolspun for this beginner crochet blanket pattern is because the yarn has basically no fuzzy “halo” around it, which creates really beautiful stitch definition. It’s also a chunky yarn, so it’s a speedy way to whip up a holiday afghan even if this beginner blanket is a larger project than you usually tackle. 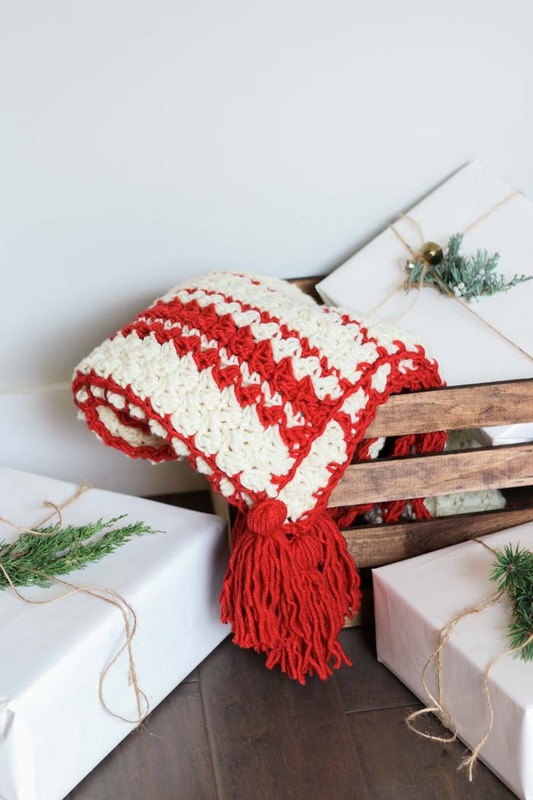 I’m happy to report that Lion Brand has created a Hygge Holiday Throw kit that includes all the yarn you’ll need, plus a printed copy of the pattern. What a fun squish-fest to receive in the mail! 🙂 You can order your kit here. Inspired by classic woven blankets, the Hygge Holiday Throw turns any chair or couch into an inviting spot to curl up. Work it in a holiday color scheme to make a modern blanket that goes with any decorating style or choose more neutral colors for an afghan that you can enjoy year round. 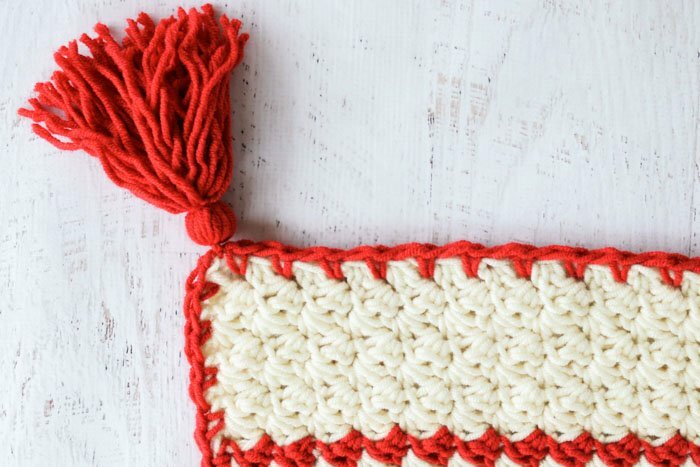 Full of texture, but not complexity, this pattern uses very simple crochet stitches and techniques and is perfect for a confident beginner. Watch the stitch video tutorial here. Blanket size can be increased by chaining any even number of stitches and working additional rows of the solid colored section (Rows 34-70). 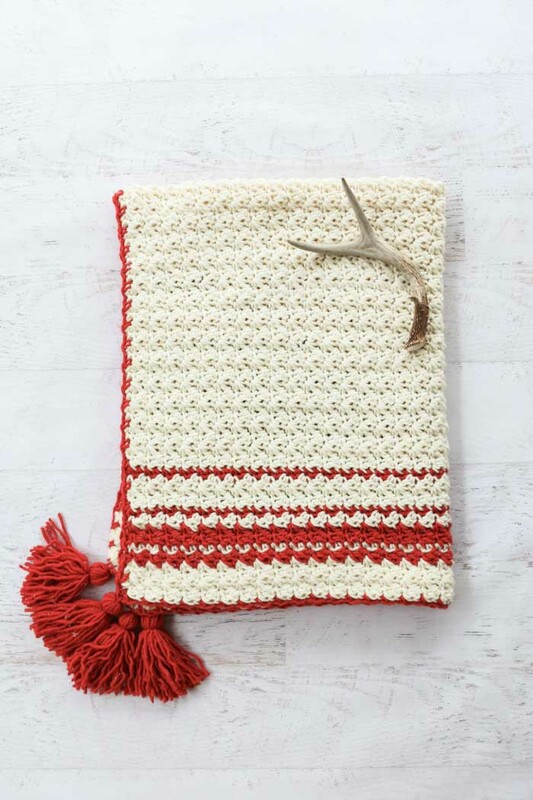 • Find a step-by-step video tutorial of the stitch used in this throw here. • Whenever possible, crochet over the tails from color changes to avoid having to weave them in at the end. Foundation Row: With Color A, ch 74. Rows 2-7: (COLOR A) ch 1, (1 sc, 1 dc) into first sc, sk next dc, *(1 sc, 1 dc) into next sc, sk next dc; repeat from * to end finishing with 1 sc in turning ch; turn. From this point on, repeat Row 2, except where noted. Row 18: (COLOR A) ch 1, sc in each st; turn. Row 19: (COLOR B) ch 1, (1 sc, 1 dc) in first sc, *skip next sc, (1 sc, 1 dc) into next sc; repeat from * to last 2 sc, sk 1 sc, 1 sc in last sc; turn. Row 23: (COLOR A) Rep Row 18. Row 24: (COLOR B) Rep Row 19. • See Photo above for close-up of border. Attach Color B in any corner. Border Round: Ch 1, *sc, loosely ch 1; rep from * working evenly around blanket; ch 2 in corners; ch 1 and sl st to first sc of round to join. Using Color B and a cardboard tube cut to 6” (or a tassel maker), wrap yarn approximately 30 times around the tube lengthwise. Insert 10” strand of yarn underneath wrapped yarn on one end of the tube. Tie a few secure knots, but do not trim these pieces. Use sharp scissors to cut the wrapped yarn at the opposite end of the tube. Fold the resulting strands of yarn in half and wrap a 10” piece of yarn around the top of the strands to create a small sphere of yarn. Trim the excess of these pieces. 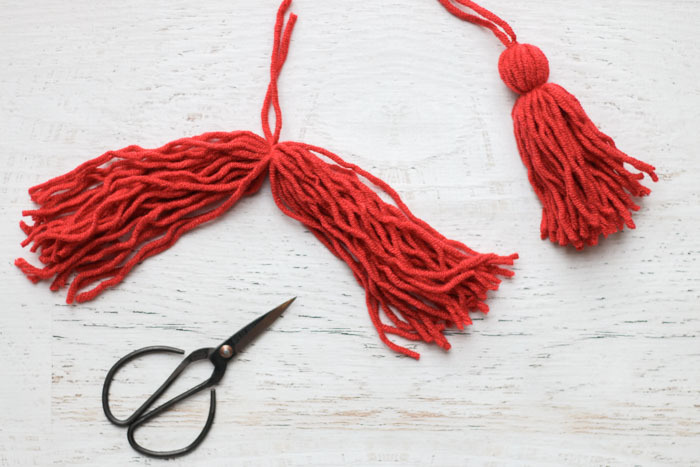 Use the tails from the first 10” piece of yarn to tie the tassel onto the corner of the blanket. Use tapestry needle to hide the remaining ends in the middle of the tassel. Repeat this process in each of the other three corners. Start a fire, brew some tea and cuddle up in hygge heaven! This is beautiful. The colour combo is perfect! I’m not sure I understand what you’re asking for? I’d be happy to help if I can. Your patterns are SO much fun! My problem is that I do not do my crocheting in the same place where I have WiFi, so if it’s not downloadable I can’t do it. I don’t mind the ads, but I don’t have MS Word. How can I download the pattern and tutorial? I totally understand. If you’d like a printable PDF, you can go here and purchase a downloadable PDF for $2.75 that’s formatted for easy printing. You just need any PDF viewer to open it (like Adobe Acrobat (free) or Preview on a Mac). Hope that helps! I know this is a hard question to answer, but about how long did it take you to make this blanket? I’m sort of a newbie…taught myself a few years ago and now I’m wanting to pick it back up. 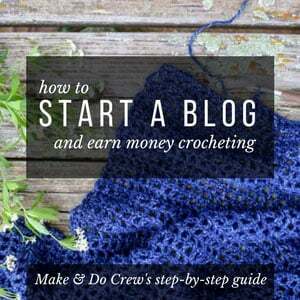 I just went today and bought my yarn to start this – can’t wait! Judging by my pace, I may get it done by the end of winter, ha. Thanks for the lovely pattern! Jess! Holiday crafting mayday! Can you please post a pic of the blanket laying flat and straight with row one on the bottom? I am trying to use the picture as a visual guide to my progress. Also, I added two extra chains to my foundation row, and got the foundation plus first seven rows out of one skein, for anyone doing math at home. Those chain+7 rows are about 4 inches tall. I love this pattern and stitch. Thank you for sharing it! This would be a gorgeous stitch to work up in bold [Gryffindor] rugby stripes. Just wanted to let you know that I am so grateful for your sharing this pattern! It is gorgeous and I have just finished my own a few moments ago. It is a Christmas gift for a family member and I could not be more pleased with how it has turned out. I used the same colors and am so glad I did! Oh, Celia. I absolutely love getting comments like this. Congrats on finishing your afghan! I’m sure it will make a wonderful gift! 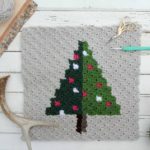 Merry Christmas and happy crocheting to you too!